The new 14m Bobcat telescopic handlers provide you with what matters the most…simplicity in design and ease-of-use, 100% confidence in the machine and its state-of-the-art safety systems, and class leading performance. All this ensures the T40140 model work with the best possible efficiency and productivity, while always focusing on safe operation. 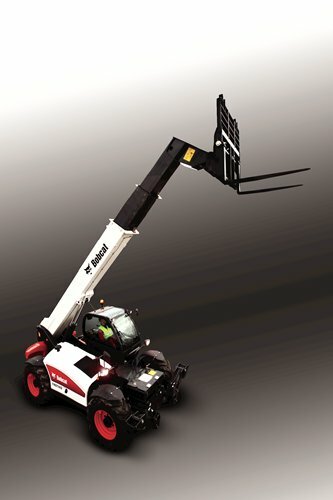 When we design a high-reach machine, we believe it should be a high-reach machine… without limitations! 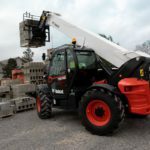 The T40140 and T40170 telescopic handlers are now equipped with a new boom that incorporates the latest state of-the-art construction techniques. Simple and modern in design, the new boom is light but strong, and has a built-in counter-bow to ensure straightness when extended under full load. There is a large contact surface between the supporting pads and the boom segments, providing for a smoother telescoping action and reduced pad wear. The new boom, which is easy to maintain, also incorporates a compensator cylinder to enable self-levelling of the fork carriage. Thanks to the design and construction of the boom, which pivots at the very rear of the machine, both telescopic models offer excellent working ranges. 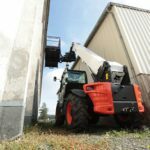 The T40140 can lift 4,000 kg to the maximum lifting height while the T40170 offers, on wheels as well as on stabilisers, over 17 m of lifting height. 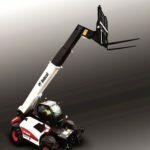 With a crane jib attachment, the telescopic handler can be used as a crane, but with all the advantages of the machine’s mobility and versatility. 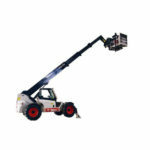 The working area of the telescopic handler is increased considerably with the crane jib. The extension jib increases lift and reach with a hook. 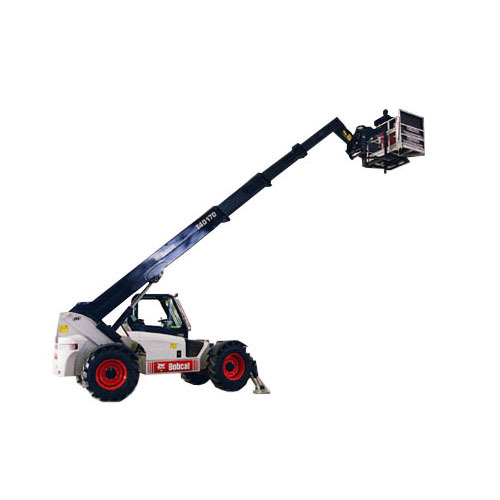 Equipped with the extension jib, the telescopic handler can position loads in places which are difficult to access otherwise. The winch is indispensable to raise and lower loads without having to move the boom. It is fitted with a proportional control system for precise positioning of the load. Equipped with either fixed or floating pallet forks, the Bobcat telescopic handler combines material handling with rough terrain capability. 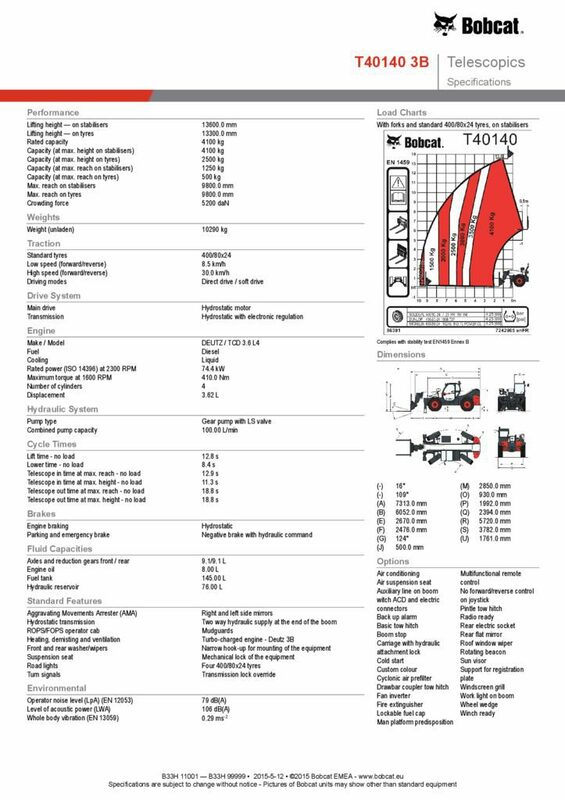 Both fork systems are certified to FEM classifications. The man platform provides flexibility and simplifies and speeds up access work, eliminating the need for scaffolding and safety nets. The platform is fast and easy to set up and can accommodate several workers at the same time. The platform, which rotates 90° right and left, can be operated as well with remote radio control. EC approved, the platform must be used on stabilisers. Both telescopic models have two stabilisers which move independently for precise positioning. The stabilisers are fully adjustable and, whether stowed or deployed, they do not detract from the compactness of the machine. Self-levelling and side shift are possible on both wheels and stabilisers. Moreover, both operations can be done at the same time, without any loss of load capacity. 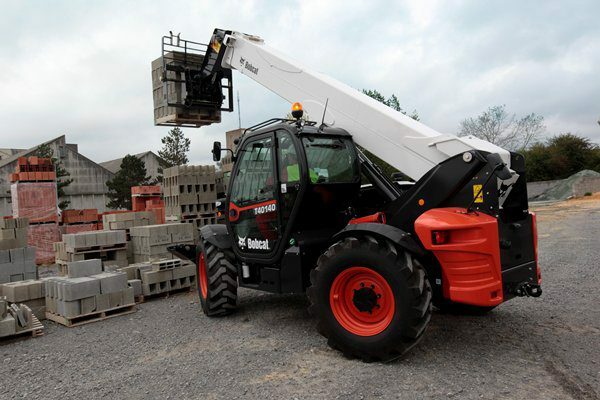 On slanted surfaces, the banking corrector can be used to level the telehandler for safe, optimum positioning of the load. The lateral tilt correction is +/- 4°. A 4-function joystick provides precise, proportional control of any combination of movements desired. The telescoping action of the boom sections is proportional and smooth, without loss of hydraulic power. The Aggravating Movements Arrestor (AMA) is an important safety feature which provides both longitudinal and lateral stability control. When the maximum authorised capacity is approached, the red load status light comes on. At the load limit, the audio overload alarm is triggered and all hydraulic movements are blocked except for the retraction of the boom to alleviate the situation. The new 14m Bobcat telescopic handlers provide you with what matters the most…simplicity in design and ease-of-use, 100% confidence in the machine and its state-of-the-art safety systems, and class leading performance. All this ensures the T40140 model work with the best possible efficiency and productivity, while always focusing on safe operation. Attention to details … improving Quality, Reliability & Durability. The new T40140 model provide a new level of confidence…confidence in the machine, in its performance and safety, and in its robustness. This is achieved by following and applying the rigorous Bobcat development standards across all functions on the new model. 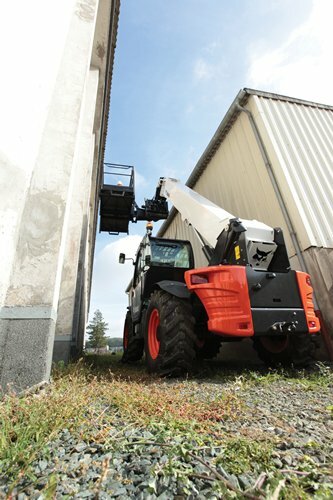 When we design a high-reach machine, we believe it should be a high-reach machine… without limitations.